Lindsey and John Lacey, left, and Courtney and Bryson Stephens, right, have teamed up to co-chair the 63rd annual Museum Ball on May 4. Journal photo by Emily Williams. 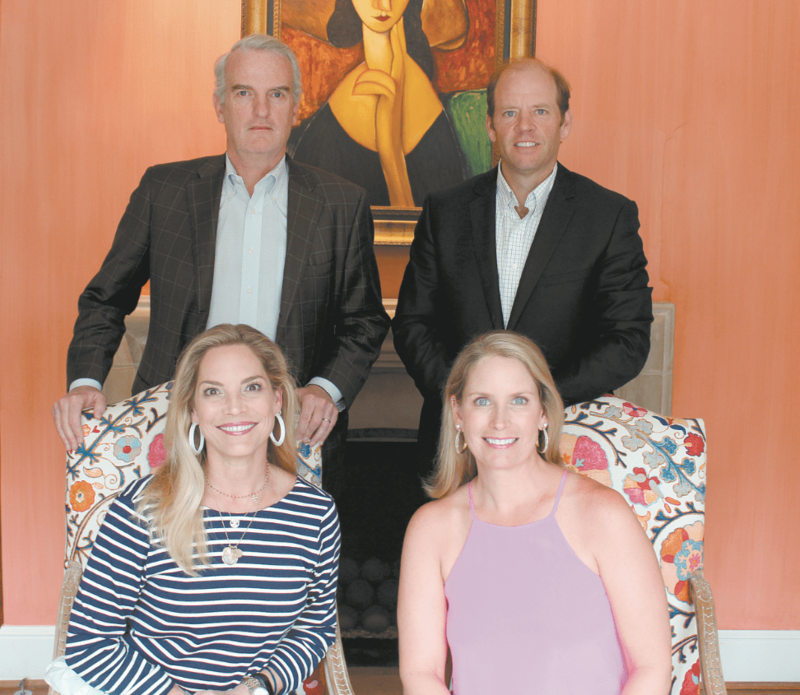 Focusing on modern pop art and the booming culture in downtown Birmingham, Lindsey and John Lacey and Courtney and Bryson Stephens have teamed up to co-chair the 63rd annual Museum Ball on May 4. The Birmingham Museum of Art will be transformed by HotHouse Design Studio into a “Pop in the City” celebration, featuring a color scheme of black and gold with pops of bright fuchsia. According to Courtney and Lindsey, the theme began with an idea to focus on pop art. With the museum’s Third Space modern art exhibition at an end, BMA’s contemporary galleries are currently being re-installed in the Pizitz Gallery and will open in time for Museum Ball guests to take a first look. “It started with the idea of pop art and just grew into this theme of Birmingham becoming an emerging cultural city, a tourist attraction,” Lindsey said. Courtney added that the museum is an integral part of that cultural boom. Museum ball guests can expect an evening of bold imagery and bold sounds from the band Universal Crush. The food, being created by Mac Russell of Shindigs Catering and Whistling Table, will make a statement, as well. It will be his first time catering the Museum Ball. Both the Laceys and the Stephenses have been patrons to the museum for many years, but each family has noticed the changes that have occurred over the past decade. With older children in their 20s and 30s, as well as younger kids who are 12 and 10, the Laceys have seen the shift in museum offerings firsthand. “My older kids did not get to do quite as much when they were kids, but our younger ones have been able to take advantage of all of the things that (the museum) has been offering,” Lindsey said. Not only have her younger kids grown up attending summer camps, her older kids are now getting involved with the junior patrons. In addition, her husband has been a supporter since the early ‘90s, but the couple’s involvement ramped up about five years ago when they joined the Collector’s Circle for Contemporary Art, which offers its members a variety of social events, trips and education programs. “I get to see everyone in the family enjoying the museum on every level,” Lindsey said. Back in the early 2000s, Courtney was involved in the beginning stages of the Junior Patrons board at the museum and has been a supporter ever since. Since her first few years of support, Courtney has noticed a complete shift in junior patron involvement. She noted that the explosion of involvement from younger generations can be seen at the hugely attended Art on the Rocks summer series, which draws in hundreds to each event for a night of live music, tours of the museum and themed food, drinks and art activities. “That just wasn’t offered when we were that age,” Lindsey said, but now she sees her older kids excited to attend these events at the museum. The funds raised at the event will help the museum continue to reach out to even younger generations, benefiting the BMA’s educational outreach programs that increase student, educator and parent access to the arts. “I think the museum is a great, community-owned entity, and that’s the important message for us,” John said. “We are trying to draw attention to the new emerging Birmingham. And changes occurring and bringing more younger people to the museum are important to create that emergence. For more information, visit artsbma.org.